Portrait of Benjamin Page, artist and date unknown, but probably c1826. From the collection of Page family descendants, Frank and Trudy Drew. "New Hampshire, Death Records, 1654-1947," index and images, FamilySearch (https://familysearch.org/pal:/MM9.1.1/FSV1-ZHD : accessed 28 Nov 2012), Edson Page, 13 Jan 1918. 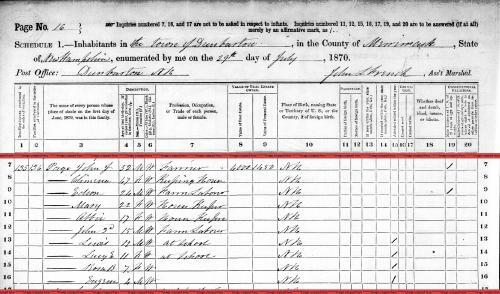 "New Hampshire, Birth Records, Early to 1900," index and images, FamilySearch (https://familysearch.org/pal:/MM9.1.1/FLPM-L41 : accessed 28 Nov 2012), Eugene Page, Sep 1866. "New Hampshire, Death Records, 1654-1947," index and images, FamilySearch (https://familysearch.org/pal:/MM9.1.1/FSJG-CQQ : accessed 28 Nov 2012), John H. Page, 27 Mar 1905. "New Hampshire, Death Records, 1654-1947," index and images, FamilySearch (https://familysearch.org/pal:/MM9.1.1/FSJG-CN5 : accessed 28 Nov 2012), Lewis N. Page, 19 Feb 1934. 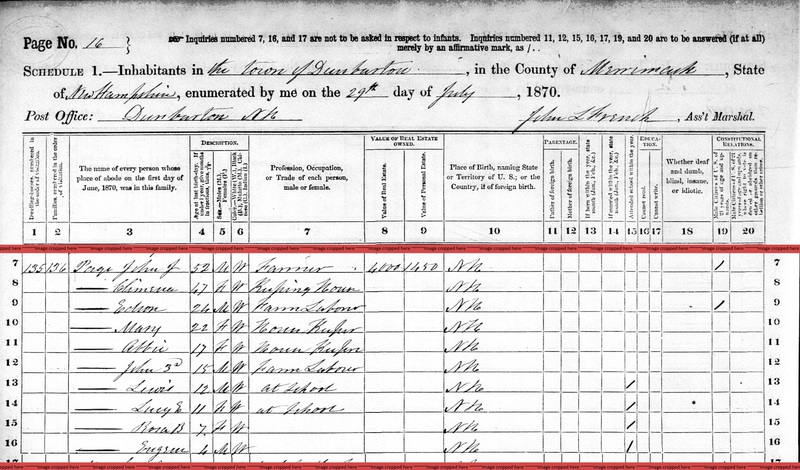 "United States Census, 1930," database with images, FamilySearch (https://familysearch.org/ark:/61903/1:1:X7NV-HL6 : accessed 10 December 2016), Lewis N Page, Dunbarton, Merrimack, New Hampshire, United States; citing enumeration district (ED) ED 32, sheet 2B, line 93, family 27, NARA microfilm publication T626 (Washington D.C.: National Archives and Records Administration, 2002), roll 1304; FHL microfilm 2,341,039. "New Hampshire, Birth Records, Early to 1900," index and images, FamilySearch (https://familysearch.org/pal:/MM9.1.1/FLP9-QM6 : accessed 28 Nov 2012), Mira Paige, Jun 1759. "New Hampshire, Births and Christenings, 1714-1904," index, FamilySearch (https://familysearch.org/pal:/MM9.1.1/FDNH-RFX : accessed 28 Nov 2012), Page, 20 May 1863; citing reference , FHL microfilm 1001028. "New Hampshire, Deaths and Burials, 1784-1949," index, FamilySearch (https://familysearch.org/pal:/MM9.1.1/FD24-SQK : accessed 28 Nov 2012), Rose B. Colby, 31 Oct 1944; citing reference , FHL microfilm 2294749. Roxalana R. Page was born perhaps about 1815. 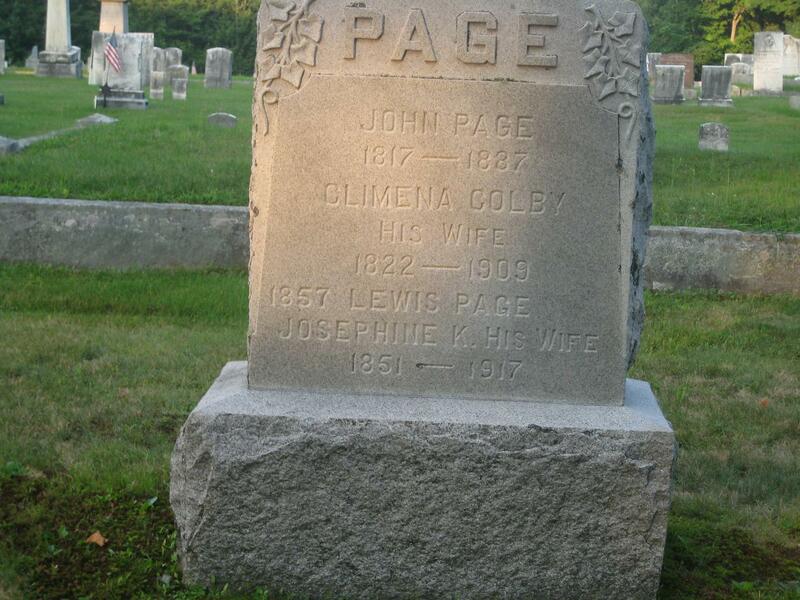 Georgianna married Henry Albert Colby, son of George S. Colby and Ann M. Heath, in New Hampshire. living at 1100 Boylston Street, Boston, Massachusetts. 1910 United States. Bureau of the Census. 13th census, 1910 population census schedules, Washington, District of Columbia: Bureau of Census Micro-Film Lab, ([19--?]) , Census Place: Boston Ward 10, Suffolk, Massachusetts; Roll: T624_617; Page: 12A; Enumeration District: 1411; ; FHL microfilm: 1374630. 1920 United States. Bureau of the Census. 14th census, 1920 population census schedules, Washington, District of Columbia: The National Archives, ([193-?]) , Census Place: Boston Ward 12, Suffolk, Massachusetts; Roll: T625_735; Page: 14A; Enumeration District: 328; Image: 484.